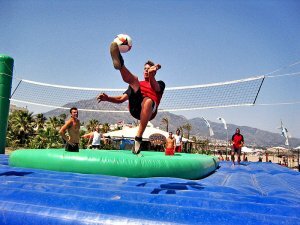 Bossaball is a relatively new sport and was derived from Spain in 2004. Since then the sport has gone on to have international acclaim with countries such as Brazil, Germany, Netherlands, Portugal, Romania, Singapore, Kuwait, Ecuador and Saudi Arabia all have very successful Bossaball teams. Whilst international competitions are limited, teams from respected countries travel the world to try and raise awareness of the sport. The game is a slight variation of volleyball and requires you to hit a ball over a net in order to win points. You can use any part of your body (head, feet, hands) to get the ball over the net and into your opponents section. The games take place on a massive inflatable with a trampoline found on each side for added bounce. The team with the most points at the end of the game is deemed the winner. The number of players in a team often ranges from 3 to 5. The teams can be mixed of males and females with no restriction on gender per team. One player will be designated on the trampoline section of the arena at all times with players rotating after every point. All that is needed is a Bossaball court and of course, a Bossaball (very similar to a volleyball, in fact a volleyball will be suffice). The court can be of any size but are usually around 50 yards in length and 30 yards in width. In the middle of each court must run a net around 3 metres high. On either side of the court must be a trampoline section, an inflatable scoring section and an inflatable out of bounds section. Points are scored by successfully hitting the ball over the net into your opponents section and for them being unable to return the ball. 3 points are awarded for hitting the trampoline section of the court and 1 point awarded for anywhere else inbounds on the court. If the ball touches the Bossa (the ring around the trampoline) then the game continues as normal. In order to win a game of Bossaball your team will need to reach 25 points first. If the games get to 24-24 then a team must win by two clear points to win that set. Games are generally played out over the best of 3 or best of 5 sets. Teams consist of 3-5 players and a mix of male and female players are permitted. Serves can be made using any part of the body as long as they are ‘creative’. You can hit the ball once using your hands and twice using your feet or head when the ball is on your side of the court before a team mate must then hit the ball. A team can hit the ball up to 5 times before they must try and get the ball into their opponents half. Games have no time limit and can only be won by reaching 25 points and by two clear games. Best of 3 or 5 sets are usually in operation. After each point teams rotate their positions clockwise so that a different person is on the trampoline section each time.